About a year ago, I wrote about a hypothetical "big distant future splurge" for when I got a bit more well-established financially. It wasn't something I would have indulged in anytime in the next half-decade, but it was nice to daydream. That "shopping fund" I mentioned has not, by the way, grown much beyond the $250 it contained back then: My emergency fund savings and (slightly) accelerated student loan payments take first priority and I've also traveled quite a bit. My "shopping fund" is also the source for my "off-budget" workwear purchases, including the Cole Haan Catalina wedges I recently bought (Nordstrom Rack has the best price online, but in a very limited size range). Since last year, my understanding of my personal style "needs" versus "wants" has evolved, and I've found that I'm satisfied with the handbag collection I have. It covers all the bases when it comes to my needs, and even what I want to wear. I could even resell a few with no real effect, like that Annabel Ingall Jojo (discontinued, similar) and Rebecca Minkoff MAB satchel (discontinued, similar). The latter was my biggest regret purchase ever, as I mentioned on Save Spend Splurge. I realize now that my main criteria when it comes to whether I'll actually wear a handbag is that it must be, above all, easy to carry. My favorite bags, whether for work, travel, or just walking around, are my large Longchamp totes. They're roomy, light, waterproof, easy to dig around in, and sit comfortably on the shoulder: They're the definition of "easy" and entirely unfussy. Most of the bags I considered for my hypothetical future splurge would not, as far as I can tell, fit my "easy to carry" criteria. Even if bags like the Givenchy Antigona or the Saint Laurent Duffle I was dreaming of are not that fussy in look or design, I'd potentially find them a bit annoying to use just because they're less easy to carry than what I already own. Out of the designer bag designs I'm familiar with, the Mulberry Bayswater probably best resembles the type of large tote bag I prefer. This is all a very abstract discussion, of course, as I probably can't bring myself to spend anywhere near that much on a bag anytime soon, not when I already have a perfectly functional collection. That's not to say that I've completely stopped daydreaming of hypothetical big purchases. Although I was initially unsure of how useful a trench coat would be in NYC's climate, I've gotten tons of wear from the Everlane Classic Trench (my review here) I bought last year. 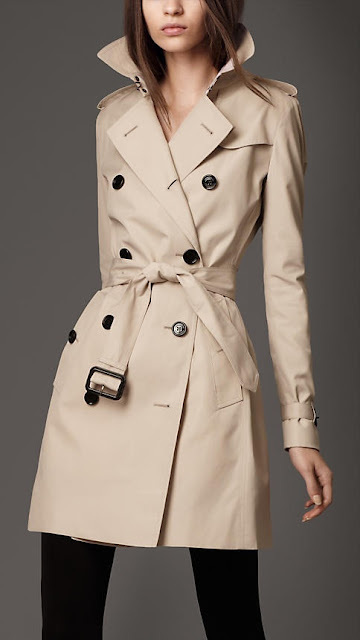 It makes me contemplate whether one of Burberry's classic trench coats could be a better "big distant future splurge" to set my eyes on, in terms of versatility and cost-per-wear ratio. It's not something I'd act on anytime in the next calendar year, probably not for eighteen months or more, but it's something that I think I could justify a fair bit sooner than I could have done with a similarly priced handbag (which would have happened in four or five years or more), as a coat arguably has more utility. A higher-end trench coat would have certain advantages over the Everlane one: a full lining, for one, a buckle detail at the wrist, and I'd also plan on putting money into tailoring to get a closer to perfect fit. Considering a replacement for my currently well-functioning Everlane trench as early as twenty or so months after purchase is, admittedly, not fully consistent with the tenets of minimalism that I'd like to embody. However, my general line of thinking here also (maybe?) shows that I've come a long way in terms of understanding what I'll actually wear and use and also being able to identify when I have all I need in a certain category, i.e. handbags. Also, there's a greater than 50% chance that I'd elect not to make the purchase at all, due to both budgetary and other concerns. It's just a daydream, for now. Is there any particular item you're yearning for? Have you ever had the opportunity to finally purchase something you wanted for a long time that was a major splurge? If so, how did it feel?